Recall that Buhari’s legal team had queried Atiku’s citizenship, and also told the election tribunal that Atiku is a Cameroonian and not Nigerian. 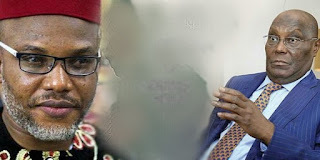 In view of the above, Kanu said, “the weak and porous argument Atiku’s defence team is making in response to this line of attack by APC, is to say that, ‘it is ludicrous to allege that a man who became Nigeria’s vice-president, who has lived, invested and paid tax in the country for years is not a citizen. Speaking further he said, “This is a wholly unnecessary digression that failed to address the constitutional question of place of birth as key qualification for anybody seeking to become the president of Nigeria. That Atiku was the Vice President is not the issue at hand but rather his suitability as defined by the constitution of Nigeria. “However, APC putting up the argument in court is a “vindication that everything I say on Radio Biafra is the truth. “It may appear outlandish and unbelievable at first, but eventually history always vindicate me. It is now over to Atiku’s team to unleash what they have against Jubril”, he continued.